. :: QUEERTANGO FESTIVAL BERLIN 2011 - NEWS ::. From 28 -31 July 2011 we are going to host the first Queer Tango Festival in the German Metropolis of Queer Life. concepts of roles within the dance. Furthermore the Queer Tango Festival wants to encourage intercultural dialogue and aims to contribute to the integration of lesbian, gay and transgender people on the dance floor. Further Information of the detailed program of all workshops and activities you will find latest in March 2011 on this website and of course the possibility to apply for all events. Come and discover the Dance of Passion with us. Meet friends, new people and have fun in one of the most interesting and vibrant capitals of the world. We are looking forward to celebrating the different aspects of Tango with you in July 2011. 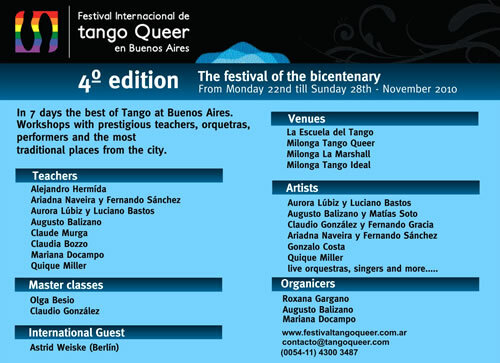 From 22 to 28 November 2010 we will celebrate the fourth edition of the Buenos Aires International Queer Tango Festival at the most principal dance-floors and saloons of our city. Joining to the celebrations in the bicentenary of the Argentine Independence this year our festival will be a big holiday in which we will cover different moments of the history of the Argentine tango up to our present, in which diverse forms of expression coexist. We will receive the city of Berlin like honor guest, with the presence of Astrid Weiske, teacher and organizer of Queer Tango Festival Berlin 2011. Our festival will offer milongas, practicas every day of the week, the best shows, orchestras, performances and workshops with the most prestigious Argentinean teachers. We thanks very much those who year by year support our proposal and give enthusiasm to our efforts constructing a tango community more open and giving place to new ways of representation that are those which maintain alive and in permanent movement our dance and music. Augusto Balizano, Mariana Docampo, Quique Miller, Aurora Lúbiz y Luciano Bustos, Claude Murga, Claudia Bozzo, Ariadna Naviera y Fernando Sanchez, Alejandro Hermida, Olga Besio, Astrid Weiske, Matias Sotto, Claudio Gonzalez y Fernando Gracia, Elizabeth Guerrero, Gonzalo Costa, Mario Orlando, Milonga Tango Queer, Milonga La Marshall, Milonga Tango Ideal, La escuela del Tango, y La escuela del baile Social. Check the schedule with all the activities of the Festival and last editions at our website. It will be re-launched in April with all activities. PARTICIPANTS FROM BERLIN WILL GET EXTRA DISCOUNT OF 10% to all activities.